Today, barbeque grills come in a variety of types. Some still utilize charcoal, while others run on propane or natural gas. Propane offers some advantages over natural gas to certain users because propane canisters make the grill portable. Additionally, propane is readily available for purchase at gas stations and home improvement stores. 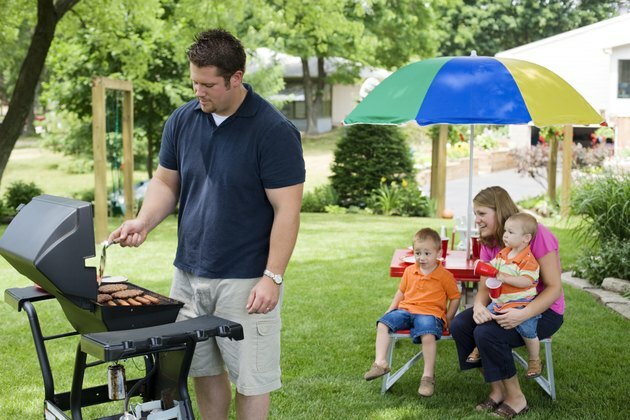 Converting a natural gas BBQ to use propane can be done at home; however, caution should be taken. Cook out on a propane grill. Check if the natural gas grill can be converted to propane use. This information is typically found in the instruction or owner's manual that came with the grill when it was purchased. If you are unsure, contact the manufacturer. The manufacturer can also sell you the conversion kit needed to complete the transformation. Shut off the natural gas supply to the BBQ, then disconnect the gas line. Remove any front or side panels in order to have access to the BBQ parts inside. Remove any orifices, regulators or gas valves marked for natural gas use. Replace them with the new parts compatible for use with propane. Ensure all fittings are tightly secured. Do not replace the panels yet. Check for gas leaks around all the connections. Prepare a solution of soapy water by mixing dish soap with water. Turn on the gas supply, but not the burners. Pour a small amount of soap water around the connections. If bubbles result, there is a leak. Turn off the gas and tighten the connection. Mallory Malesky has been writing business, finance and general knowledge articles since 2008. In her daily life, she works in corporate product management. Malesky holds a Bachelor of Science in natural science from Indiana University of Pennsylvania.